Our resistance is as international as the arms trade! The Defence & Security Equipment International arms fair (DSEI) sells everything from bullets to battleships, bringing together 1500 arms companies and representatives from over 100 countries. The results of DSEI are felt around the world as people are killed, economies are devastated, refugees are traumatised and peaceful protest is crushed. 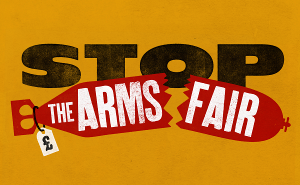 When the world’s arms industry arrives in London in September, Stop the Arms Fair coalition will do all we can to stand in its way. We’ve called a week of action at the venue to stop the arms fair being set up. The week will culminate in a mass day of action on Saturday 12th September, the weekend before the arms fair begins. In person: If you’re coming from abroad, please get in touch with us and we’ll give you any help we can. If you can’t come: You almost certainly have one of the exhibitors not far from you. During the week of action, show them that our resistance is international! Or you could challenge the British government’s massive support for the arms fair with a visit to your local UK Embassy. If you’re based in the UK: We’re keen to make links with international solidarity groups in the UK too. Come along to our meeting on 15th July or get in touch! Let us know how we can show you support too! DSEI isn’t the only arms fair in the world. There was impressive creative action at IDET in the Czech Republic in May 2015 and we know there are plans to challenge ADEX in Seoul on 20-25 October 2015 and Eurosatory in Paris on 13-17 June 2016. If you’re challenging an arms fair near you, send us a message and be in touch. If you line up the words right you can get NO, NO in a colour reading downwards!